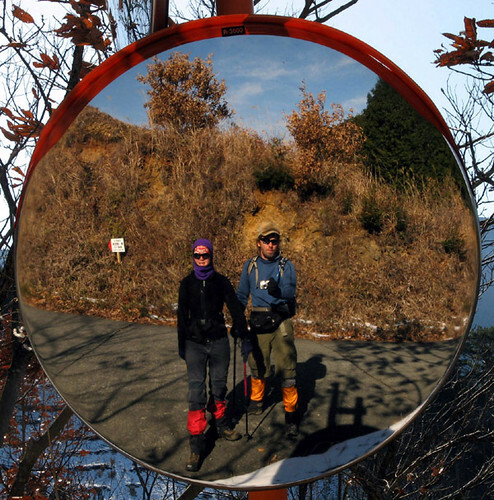 We spent this past winter vacation hiking and exploring the Sekiryo Mountains in central Kyushu. As told earlier on this blog, these hills hold a special place in our relationship with the local landscape, in part because of their remoteness and relative lack of accurate maps and information. During those two winter weeks we certainly got to know the hills better. We spent the evenings in the valley villages eating local food and lounging in hot spring baths whenever possible, before pitching our tent in local campsites which were mostly abandoned for the season. Every day we set off looking for new hiking trails, our searches based partly on internet research and partly on intuition. It was fun, relaxing, healthy, and much cheaper than traveling to some faraway place. This map shows the current status of our ever ongoing Sekiryo explorations. Green lines represent surveyed trails, yellow lines are trails surveyed this winter, and red represents, to the best of our knowledge, trails still left to survey. Blue dots are named and/or significant summits. Exploring these hills is a time-consuming but interesting process, and few things are better for one's mind and body than a hearty walk in the woods. Perhaps when we finish the survey we'll make a hiking map of the area, since none exist at present. To make full use of the short winter daylight hours, we regularly woke up at dawn. Despite the short driving distance to the trailheads, the approach typically took at least an hour. 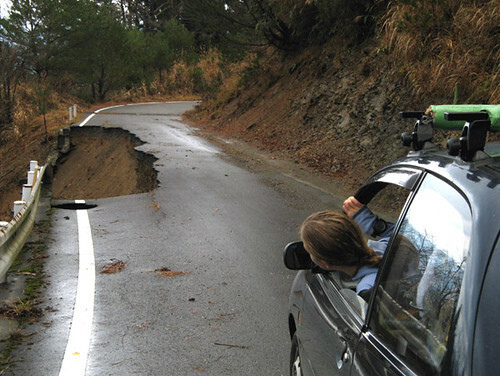 Narrow, twisty, often unpaved and boulder-strewn roads cannot be traveled quickly. Our car really took a beating, but that was OK because we were about to replace it anyway. 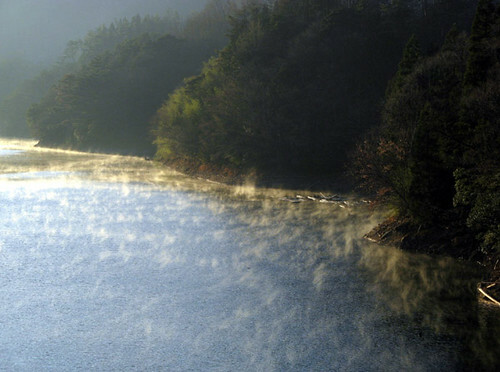 Here, morning mists drape the waters and shores of the Kamishiiba reservoir, on the way to snow-covered Mt. Goyuu. Explorers at work. 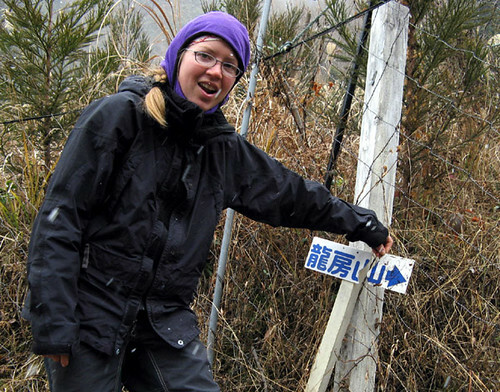 Equipment included comfortable boots, gaiters (for snow and mud), Goretex coats (the weather was usually unstable), trekking poles, radios (we often split up to explore different trails), and of course, GPS units in waterproof cases. We traveled very light for speed, often not even taking a backpack. 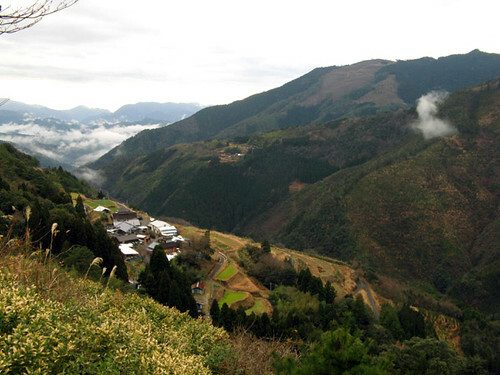 But speedy climbing is generally not possible in the Sekiryo hills, due to the rough nature of the trails. 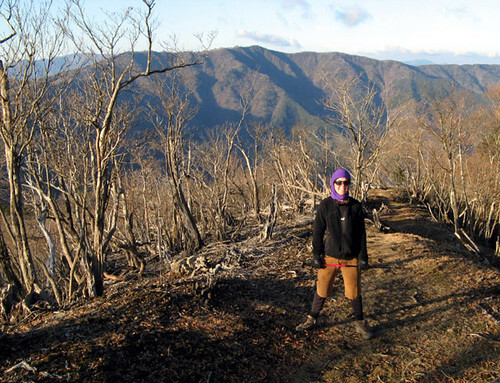 Climbing Sanpou-dake, a typical three-hour hike. Generally, we were able to do two such hikes per day, but when heavy snow fell during the second week, we had to content ourselves with one per day as both car access and the hiking became much more difficult. Although in winter there aren't the vibrant green colors and flowers one can enjoy during the other seasons, the views are better due to the clearer air and bare trees. The GPS also records more accurately withouth the obstructing foliage. Plus there are absolutely no other hikers so parking or crowded trails are certainly not a problem. 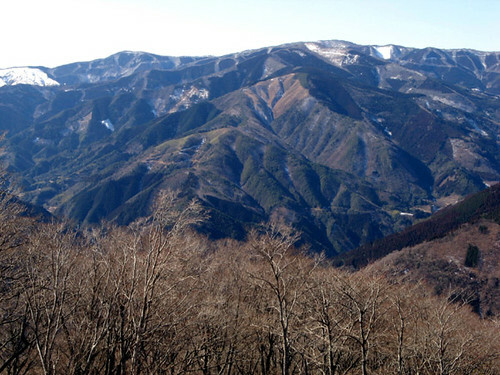 Patches of undisturbed forest left here and there on the high ridges are the treasure of the Sekiryo hills. This is what hikers really visit the area for. In the spring and summer, rare flowers can be seen here in great numbers. In the nearby plantations and clearcuts, these plants have now disappeared completely. 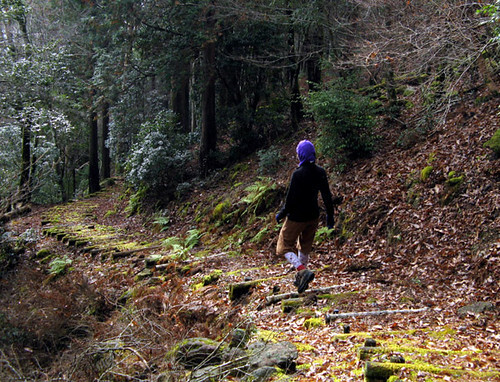 We're always on the lookout for these natural areas and as we found them, we recorded them dutifully with the GPS. Here, we found an unexpected, naturally open patch on the traverse between Mts. Ishido and Higuchi. Locating the trails in the first place was a part of the challenge, a kind of treasure hunt really. Some were written up in hiking books, others, to various levels of accuracy and detail, on the internet. Still others we found while hiking, exploring, or driving the forest roads. Occasionally, a useful trail could be gleaned from locally posted maps or signs such as this one. 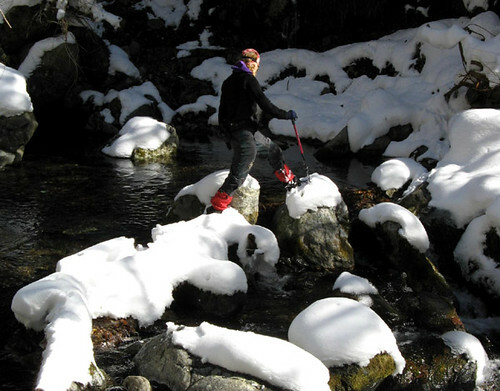 Trails in the Sekiryo are often not much traveled, and many were difficult to follow. We usually found ourselves following only tape blazes though the trackless woods. Here and there direction signs, in various states of decomposition, also showed the way. 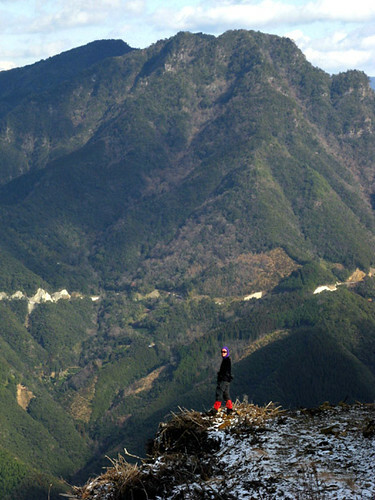 Surprises, like this mountain-top guardian on Mt. Eboshidake, were sometimes encountered. 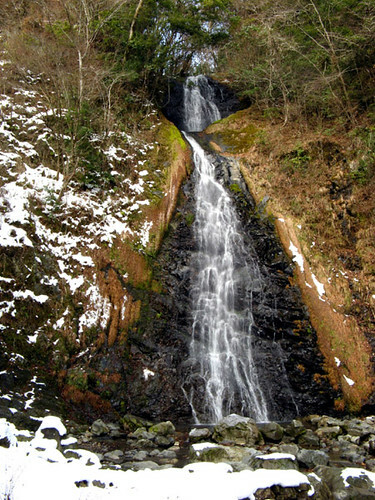 This waterfall was also an incidental discovery, near Mt. 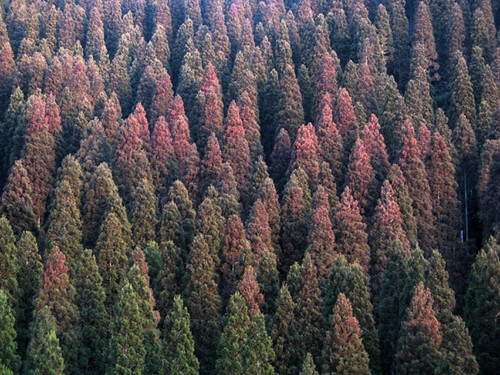 Kurodake. Descending a clearcut on Mt. 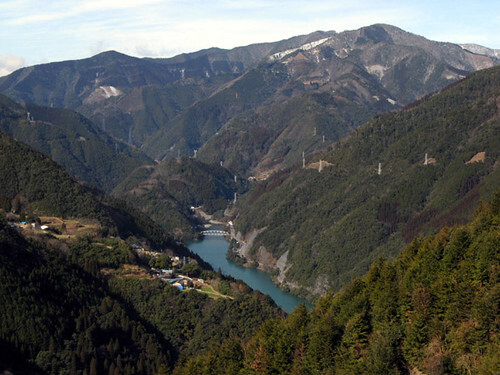 Yukifuri, a view opens up of Mt. Ryubusa, to be climbed next. Views such as this also helped us with routefinding -- forest roads such as the one visible are often starting points for trails, yet are not always drawn in maps. The second week of our explorations, the weather changed and a lot of snow fell on the hills. We had a lot of fun hiking in the snow, something we had not done since we left Canada years ago. 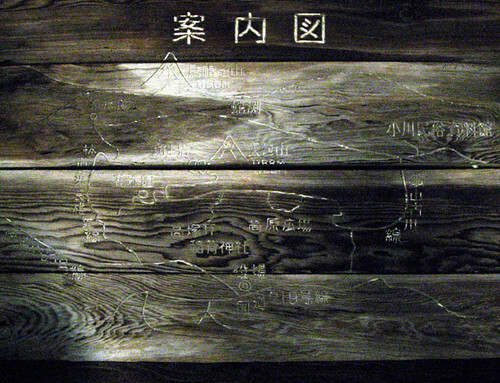 In a few places, trails are equipped with steps and such. While this makes for easier going, such trails are typically set up once and then not maintainted. In a few years, this trail too might go back to the jungle. If one does not consider the northern Japanese island of Hokkaido, the Sekiryo Mountains are one of the most remote parts of the country. Yet people have been living here, not much differently than they do today, for at least eight hundred years, if one is to believe the story of the persecuted Heike clan, who are said to have settled the area as outcasts after a crushing defeat in battle. Yet the wrath of their enemies eventually caught up with them: members of the ruling clan cleverly penetrated into the heart of the wilderness via a long, high mountain ridge, precipitating a mass suicide among the Heike who thus ran out of places to hide. At least, so go the ancient tales of these hills. Today, life is still isolated for the locals, if somewhat less dangerous. Modernity is creeping in slowly despite the long, twisty, and narrow access roads, but fragments of the charm that must have typified Japan before its headlong rebuilding, still remain. The valley of the Mimi River is the most populated place in the whole area. 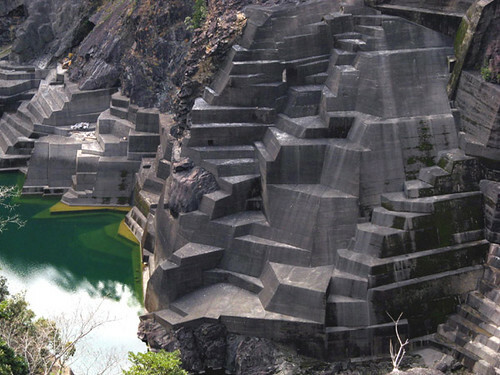 Hamlets dot the steep sides of the valley or occupy the river banks in the space left between several reservoirs that tap the river's hydroelectric potential. The crowded valley bottom and the surrounding high ridges are worlds unto their own, and in the winter possess strikingly different climatic conditions. Reluctant to drive our flimsy car through the snowy and icy higher passes, we were confined to this valley for several days, making high forays only on foot. There is really hardly any space in the V-shaped, eroded valley bottom, and what there is, is occupied mostly by the river itself and the access road. In some places, a narrow strip of houses also clings to the steep hillside, making use of every square meter of avaliable space. Living through typhoons here, with the flooding river threatening from below even as landslides menace from above, must be truly frightening. 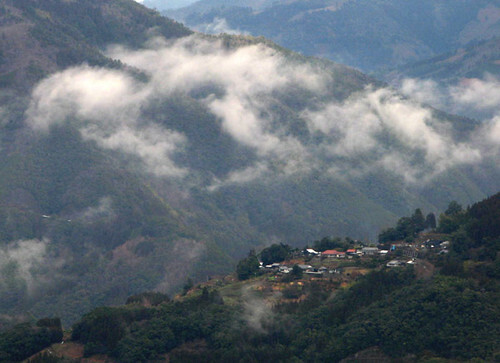 Actually, when a bad typhoon is in the offing, inhabitatnts of these villages are usually preemptively evacuated to a safer place, leaving the fate of their houses in the hands of the mountain gods. 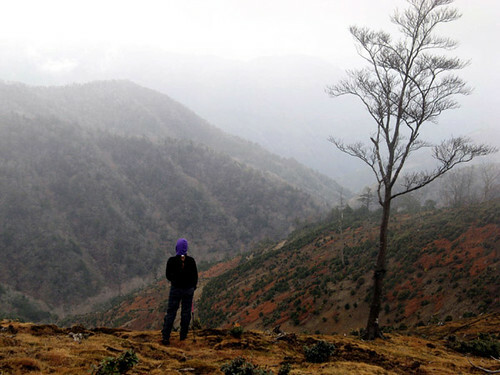 The middle slopes of the mountains often offer the safest and most productive living space, a fact that was not lost on the original settlers. Today, picturesque clumps of habitation with associated terrace paddies still dot the mountainsides. The site for a hamlet was chosen not only to take advantage of relatively level land, but also to be out of the way of major landslides. Such hamlets must have been connnected by long paths in the past, which would necessarily cross through the danger zones, as do the roads today. It's not unusual for a community to be cut off for weeks at at time when a deluge washes out a part of the access road. 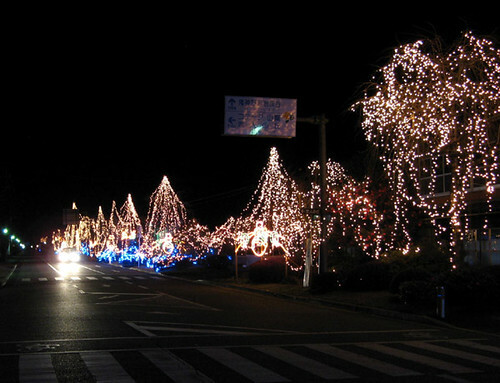 People unfamiliar with Japan might be surpised that Christmas is actually very popular here. It really makes no sense, as Japanese Christians are very few and indeed any religious experience as such is more ritual than belief for the average Japanese. Yet there is a propensity to latch on anything new, particularly if it's a seasonal thing. Thus, Valentine's Day and even Halloween are also eagerly observed, although in a 'japanized' form. So it is with Christmas, whose origins remain a mystery to the locals. Consumerism, lights, and muzak is pretty much what it's all about. But this dazzling display in an otherwise dark, cold, and lonely mountain town really does not seem so out of place. Remnants of the old are to us the most interesting elements of the villages. Generally thought of as 'backward' and to be eradicated or renewed, they have all but disappeared from the more 'modern' cities on the plains. If they had the means, the local villagers would also likely replace this old shrine with a stately concrete version. 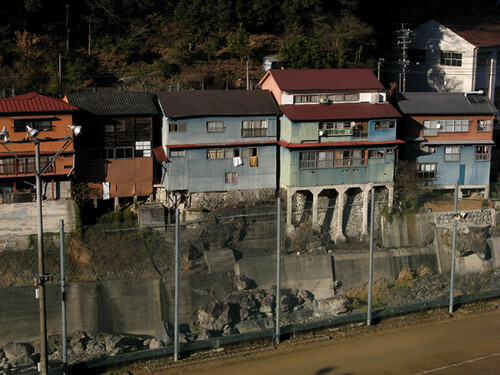 But this is the inaka (boondocks) and the shrine will remain as is, at least for a while. 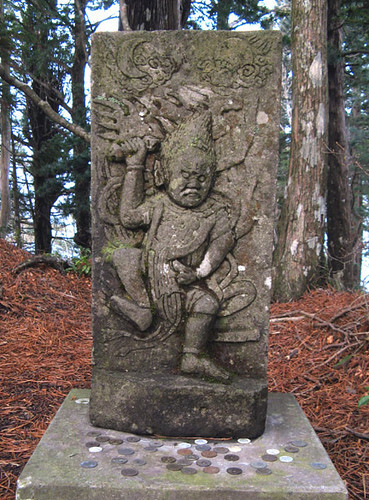 Shrines, worshipping places of the polytheistic Shinto religion, are often built on top of a steep hill, and to pray one needs to ascend the sando, or worship trail. The effort thus involved is a part of the worshipping experience. 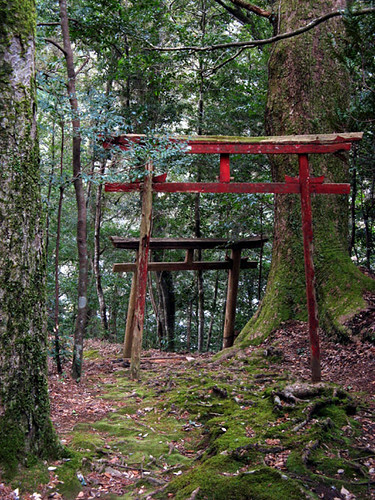 Surrounded by mature sacred trees and punctuated with torii gates, these quiet trails are a pleasure to walk. Characterized by a tart sweetness, the persimmon used to be one of the few fruits eaten by the pre-westernized Japanese. Fruit in Japan has been and still is considered a luxury; it's not unusual for a single apple to cost around $5. 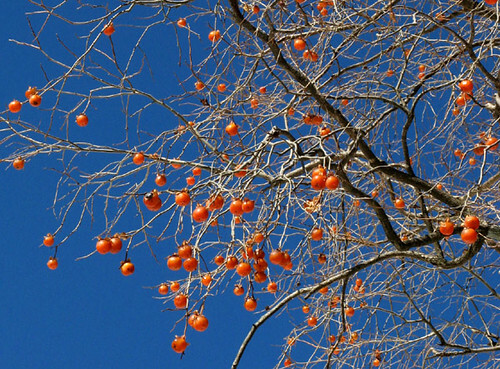 Western fruit has all but replaced traditional fare such as the persimmon, and often the fruits go uncollected, decaying on the trees. But persimmon trees with their bright orange fruits decorating the village landscape make for a quintissential Japanese winter scene. The diminutive grandmothers that still inhabit these remote hamlets have not, however, forgotten their traditions. 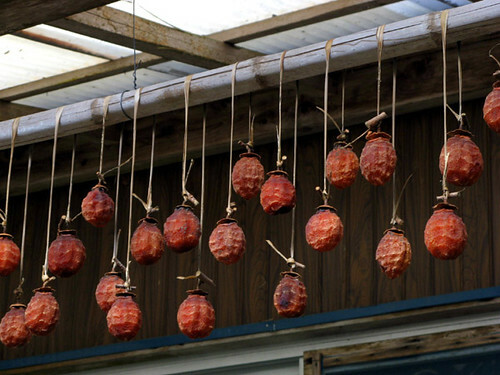 Persimmon fruits are collected, skinned, and dipped in sake, then dried like this in a process that concentrates their sweetness and removes much of the tartness. These decorative dried fruits are ready to eat around New Years when a thin coating of white mold develops on the surface. Even city people appreciate a midwinter gift of dried persimmon. There is a simple, practical beauty to country living anywhere. 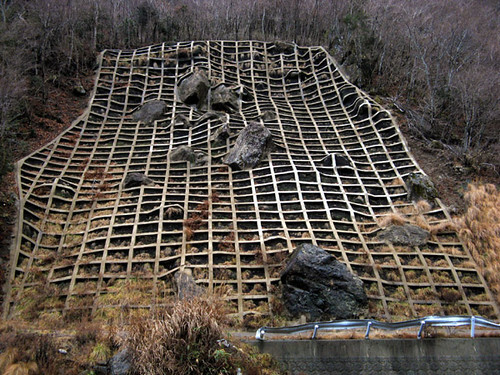 In Japan, the resourceful inhabitants of the hills are not afraid to use whatever technology percolates this far from the advanced cities on the faraway plains. 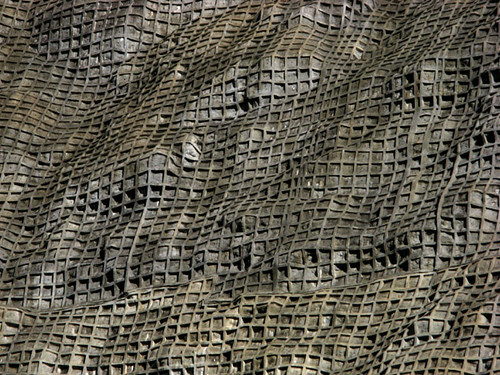 Among such innovations, for better or worse, is the ever-popular corrugated sheet metal or totan, as it is known locally. Cheap and convenient, it quickly replaced traditional but time-consuming surfacing such as straw and mud walls or the thatch roof. 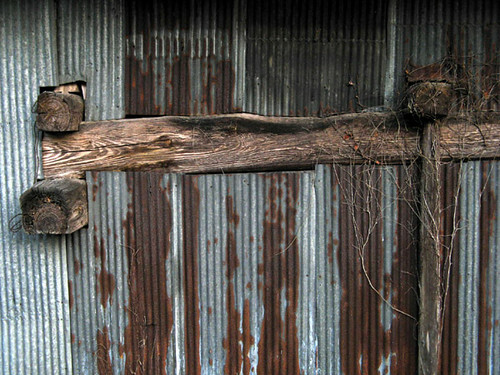 Yet, as in this case, the concept of wabi-sabi (the beauty of roughness and imperfection) is often, if unwittingly, preserved. 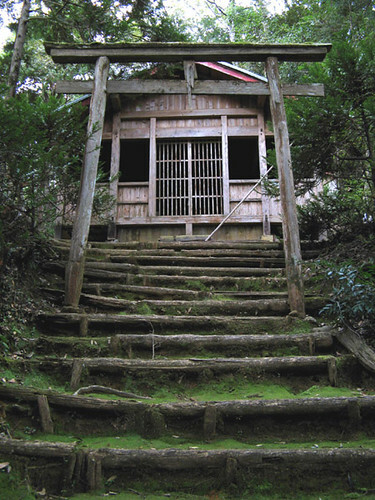 In the modern era, the rusty totan is spurned as ugly and unacceptable, but in the country its roots have grown too deep for it to just disappear. Now there is even a transparent plastic version, and we have seen a house walled and roofed entirely with the stuff. Wouldn't it be so cool to live in a translucent, albeit drafty house?